The New Jersey Municipal Environmental Risk Management Fund (EJIF) was established by property and casualty joint insurance funds to provide their member public entities and utility authorities with environmental coverages. New 2017 EJIF Seminar: "Keeping Up with Changing Regulations"
Environmental Alert - July 2016: "Property Acquisitions and the EJIF"
Environmental Alert - November 2014: "NJ Takes on Climate Change: What You Can Do To Plan"
Environmental Alert - February 2014: "2014 Remedial Action Deadline Extended"
New Requirements for Aboveground Storage Tanks with Underground Piping. 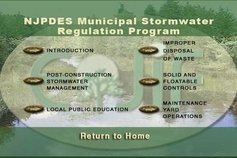 View the EJIF Stormwater Training Video to help satisfy your annual training requirement.